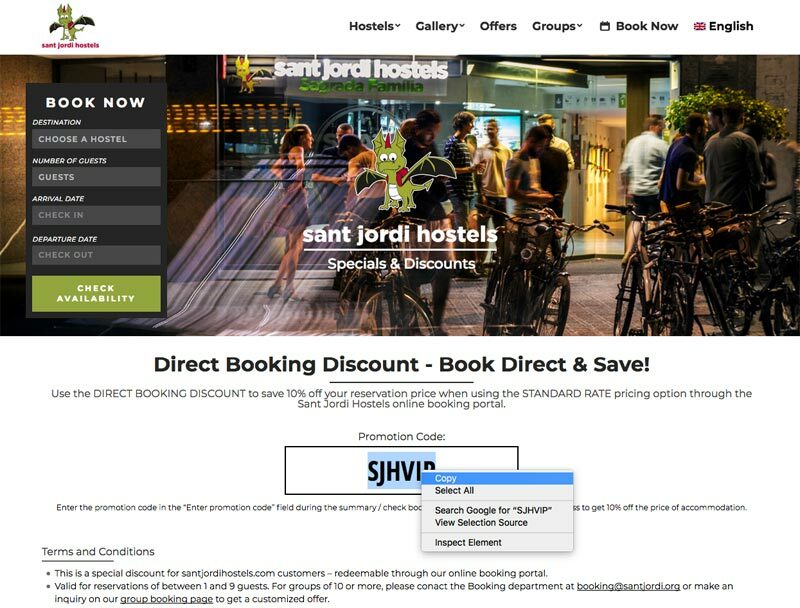 Use the DIRECT BOOKING DISCOUNT to save 10% off your reservation price when using the STANDARD RATE pricing option through the Sant Jordi Hostels online booking portal. 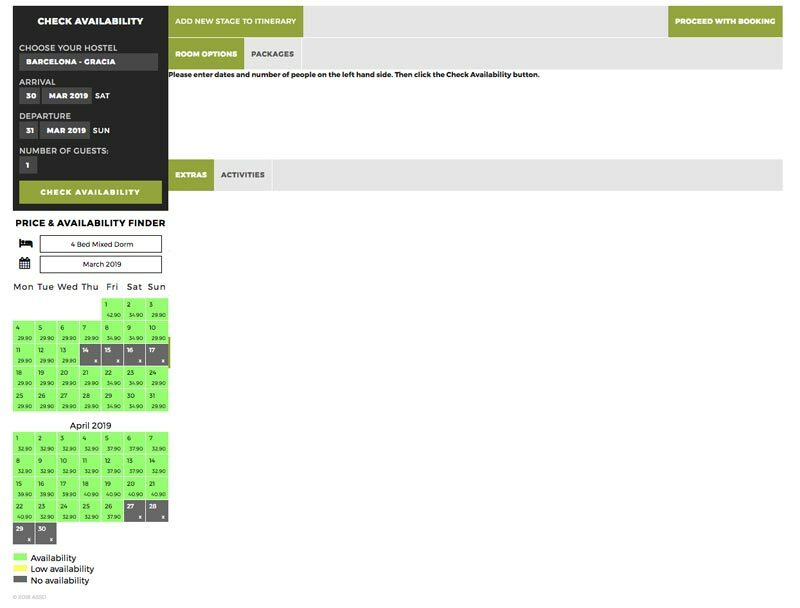 Enter the promotion code in the “Enter promotion code” field during the summary / check booking stage of the online booking process to get 10% off the price of accommodation. This is a special discount for santjordihostels.com customers – redeemable through our online booking portal. Valid for reservations of between 1 and 9 guests. For groups of 10 or more, please contact the Booking department at booking@santjordi.org or make an inquiry on our group booking page to get a customized offer. The discount can only be applied to the price of the bed/s at the moment of booking (it can not be applied to any other offered services or products). 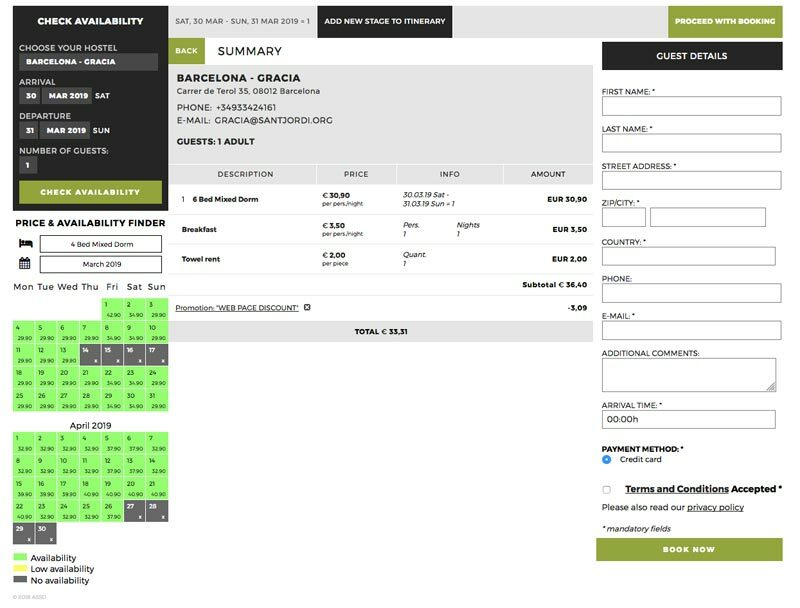 The discount can only be used with the standard rate reservations. It cannot be used with the early-bird or non-refundable rate options. The discount is only redeemable through the Sant Jordi Hostels Barcelona online booking portal. Valid for reservations of between 1 and 9 guests. For groups of 10 or more, please conact the Booking department at booking@santjordi.org or make an inquiry on our group booking page to get a customized offer. Highlight and copy the promotion code from the sale/discount description page. 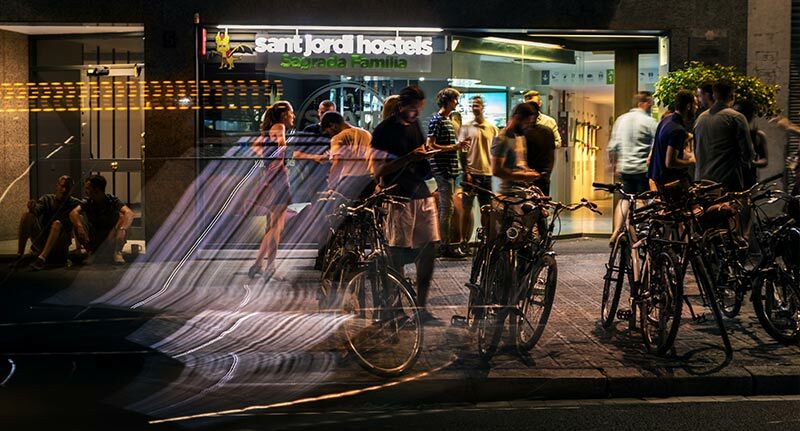 Using the Sant Jordi Hostels online booking engine, select the desired hostel, arrival & departures dates, number of guests and click "CHECK AVAILABILITY". 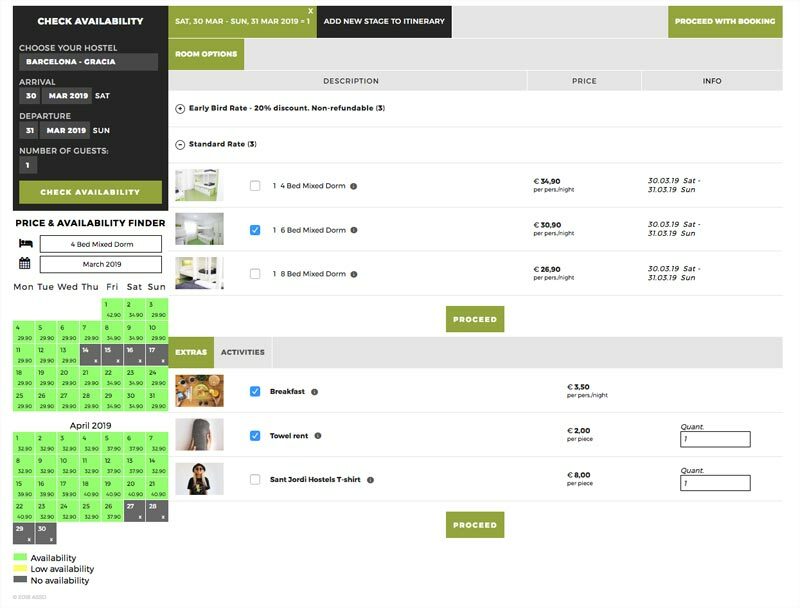 Select the preferred room type, add extra products / services and click "PROCEED". On the summary / check reservation stage click the "ENTER PROMOTION CODE" link. Enter the code for the preferred promotion and click "APPLY". Enter all required contact & payment details, check the "Terms and Conditions Accepted" box and click "BOOK NOW". Be sure to review all reservation details before confirming reservation. 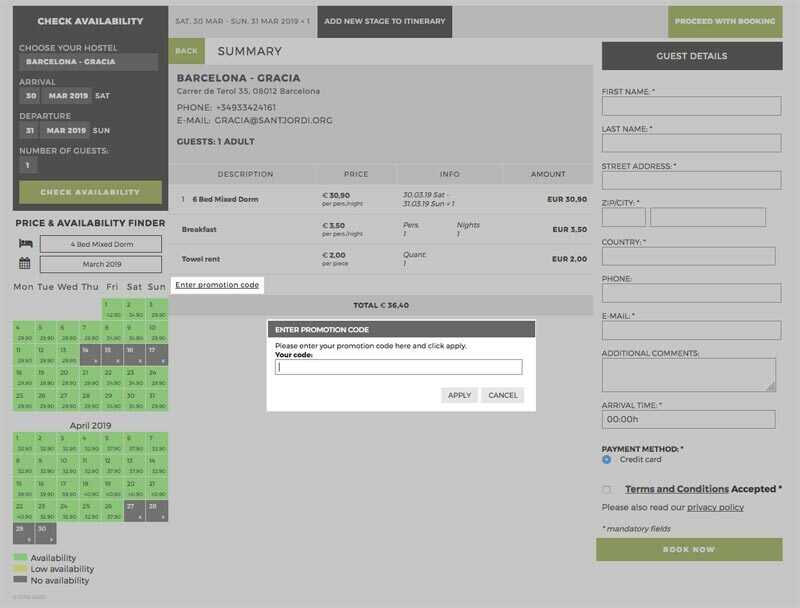 A confirmation email will be sent to the provided email address within 5 to 10 minutes of confirming the reservation.